Orange you glad to see it? Who doesn't have a picture of the Nokia X these days? It's looking increasingly more likely that we will see the Nokia X Android smartphone land at MWC 2014, and in true Nokia style it's tipped to arrive in a number of colours. 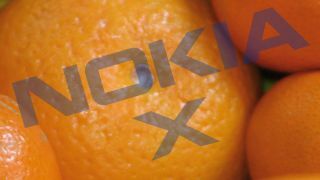 Fresh images claiming to show off the Nokia Normandy device depict an orange handset - apparently one of six colours the Android-toting smartphone will arrive in. The images were picked up by French site nowhereelse, and while the handset does seem to follow the design of previous leaks, there's no guarantee the phone in question is actually running Android. In fact, the French site goes as far as to say the "authenticity [of the images] is far from proven" - so take this latest leak with a sizeable pinch of salt. The Nokia X is rumoured to sport a 1.2GHz dual-core processor, 4-inch display, 512MB of RAM and 5MP camera. TechRadar will be out in force at MWC 2014 to bring you the latest on any Android toting Nokia which may show up.